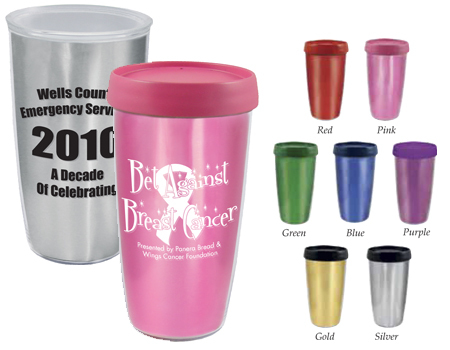 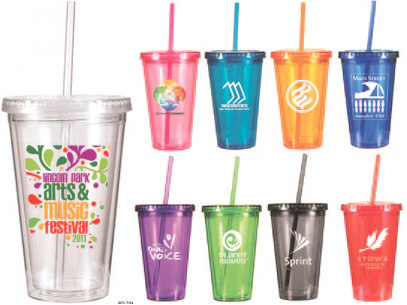 Our Custom Imprinted Tumblers are perfect for promotions, parties, special events, and more! 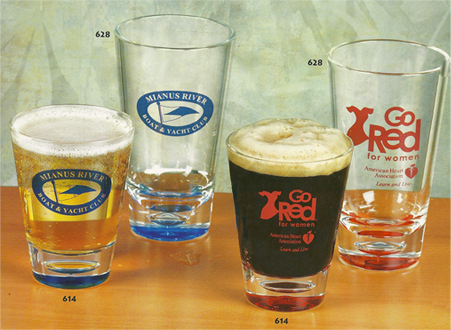 These Imprinted Tumbler Glasses are made of a heavy-wall acrylic material, and they are available in a wide range of sizes and styles. 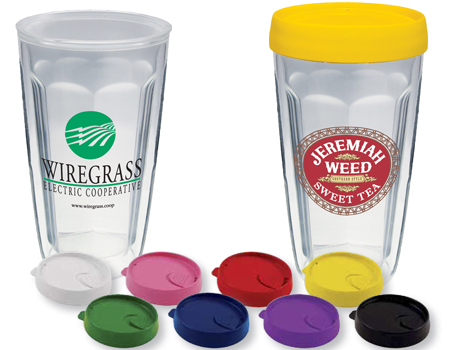 Choose from Tumbler Glasses with matching Lids and Straws, Fluted Tumblers, Thermal Tumbler Glasses, and more! 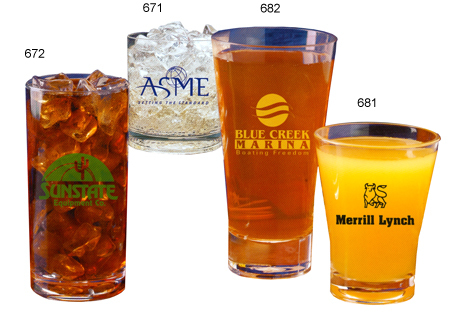 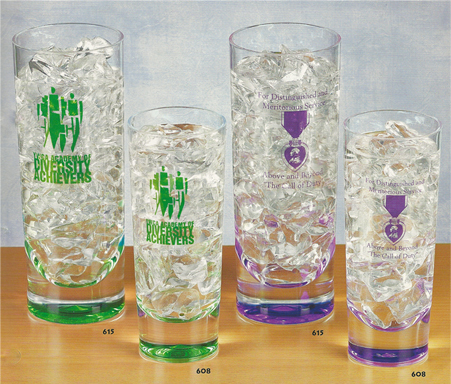 To order Custom Tumbler Glasses, please contact us toll free at 1-800-233-0828..
714016 Tumbler with 1 Color Imprint 4.35 3.89 3.69 3.59 3.47 3-1/2" 3-1/2"
80-171406 Tumbler with Full Color Imprint 4.85 4.43 4.29 3.97 3.99 3-1/2" 3-1/2"
*Glasses come with Lids and Straws; must be ordered in lots of 48 pieces; one side imprint only. 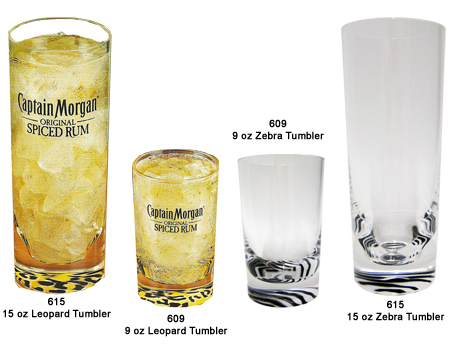 672 Tall 15 oz Straitwall Tumbler 2.69 2.61 2.54 2.47 3" 2-1/2"
671 Short 13 oz Straitwall Tumbler 2.47 2.41 2.35 2.32 2" 2-1/2"
682 Tall 20 oz Fluted Tumbler 3.55 3.46 3.37 3.28 3" 2-1/2"
681 Short 12 oz Fluted Tumbler 2.65 2.56 2.50 2.45 2" 2-1/2"
614 14oz Bubble Color Tumbler 3.46 3.37 3.28 3.24 2" 2-1/2"
628 1oz Color Bubble Tumbler 4.45 4.32 4.23 4.14 2" 2-1/2"
608 8.5oz Color Accent Tumbler 3.15 3.06 2.97 2.92 2" 2"
615 15oz Color Accent Tumbler 4.36 4.27 4.18 4.09 2" 2"
609 9oz Safari Theme Tumbler 3.55 3.51 3.42 3.37 2" 2-1/2"
615 15oz Safari Theme Tumbler 4.63 4.54 4.45 4.36 2-1/2" 2-1/2"
TT16 16oz Thermal Travel Tumbler 5.13 4.86 4.68 4.59 4.50 2-1/2" 2-1/2"
TP16 16oz Thermal Tumbler 4.59 4.32 4.14 4.05 3.96 2-1/2" 2-1/2"
TTF16 16oz Thermal Travel Tumbler with Foil Inserts 5.13 4.86 4.68 4.59 4.50 2-1/2" 2-1/2"
TPF16 16oz Thermal Tumbler with Foil Insert 4.77 4.50 4.32 4.23 4.14 2-1/2" 2-1/2"
For additional information on our Custom Imprinted Tumblers or our other Bar, Restaurant, Night Club, and Catering Supplies, please contact us at 1-800-233-0828.